Jonny Nebula was the greatest heavy-grav fighter to ever compete in the Orbs. Galactic Champion for two decades running, no one could touch his skill. Until his final, brutal fight, when his reign came to a bloody, deadly end. But, as Roak is about to find out, there's always an encore. An old friend from his past. A job that shouldn't exist. A web of lies and deceit that goes deeper than anyone knows. Roak has his work cut out for him. It'll take all of Roak's skills as the galaxy's premiere bounty hunter, to track down a dead man. Especially one that refuses to be found without a knockdown, drag out, to the death (again), fight! What did you love best about Nebula Risen? Everything. I was really impressed overall with the story that Jake Bible has crafted anmd the world in which it takes place. The AI on board the ship and Roak. The banter and relationship they develop were the stuff of great Sci-Fi. Which character – as performed by Andrew B. Wehrlen – was your favorite? Roak. Mr. Wehrlen did an excellent job of portraying the character and all his flaws. The facade of emotionless bounty hunter but clear that there is a lot more going on under the surface. I laughed a lot. The character interactions were great. The action was well choreographed and fast paced. It drew me in and left me wanting more. I was given a free copy of this audio book and have voluntarily left a review. Roak, Would that we all could be so...Cool! Jake Bible is as prolific as he is imaginative. I can't wait for his next offering and the scary thing is that I know that I will not have long to wait. Nebula Risen has it all, action adventure and the nagging suspicion that the protagonist is may be not just human. Add an A I driven space ship and galactic skullduggery and you end up with a very satisfying listen. Andrew B. Wehrlen was the perfect choice for this books narration with his spot on characterizations and clear gender delineations, I was given this free review copy audiobook at my request and have voluntarily left this review. awsome series well worth it and the narration is spot on you can imagine the characters and the world they live in. Bounty hunter Roak is forcefully hired to locate and bring Johnny Nebula, one of the greatest heavy-grav fighter, who died during a fight. During his search, Roak will meet an old ‘friend’, who will just increase Roak’s worries. I really enjoyed Roak’s cheeky personality and his conversations with ‘Hessa’ the special and quirky AI in Roak’s spaceship. I always appreciate when there is good humor in books, and there are quite some funny moments in this one. There is also plenty of action to keep the reader entertained. This could have been a 5 star book, but I was not completely invested in Roak’s search. I did not feel the urgency of it. I was much more intrigued about Roak’s friend, and the end twist was just superb. Roak’s mission felt kind of an excuse to show us the truth about himself. From the beginning of the book I had the feeling that the story would have worked better if written in first person. Every time we switched from Roak to the narration I kind of expected to hear it narrated from Roak’s POV. Andrew B. Wehrlen did a wonderful job in becoming Roak, and delivered a great interpretation, transmitting Roak’s emotions and sounding as cheeky as I am sure Bible intended. Other characters were also well portrayed and the audio production was spotless. I am looking forward to listening to other books by Bible. I have already listened to Mech Corps, but I have to say that I enjoyed this one more. Bible and Wehrlen - A winning team! Nebula Risen is a fast paced, roller coaster of a galactic ride that features plenty of action, witty dialogue and highly interesting characters. Roak is coerced into taking a hunt for Jonny Nebula; a search that will see him alternately being the hunter and the hunted as he tries to unravel the mystery of the missing Nebula. As usual, Bible has created a great plot, an interesting range of characters that are well defined, have solid back stories and contribute appropriately to the unfolding mystery. Andrew Wehrlen does an equally amazing job of the narration. His ability to separate each characters voice makes dialogue easy to follow and creates great atmosphere throughout. I am loving working through Jake Bible's portfolio and only wish I had listened to the first in the Roak series before Nebula Risen. I guess I will just have to do that now anyway! I would like to thank the author, narrator and publisher for providing me this book in return for an unbiased review. I really loved Roak so I couldn't wait to hear this one. Plus I'll pretty much read anything by Jake Bible. Lots of awesome sci-fi action. Just what I needed. Andrew Wehrlen is an amazing narrator. I always love his work. He makes any book better. Another Really Good Entry In The Series. 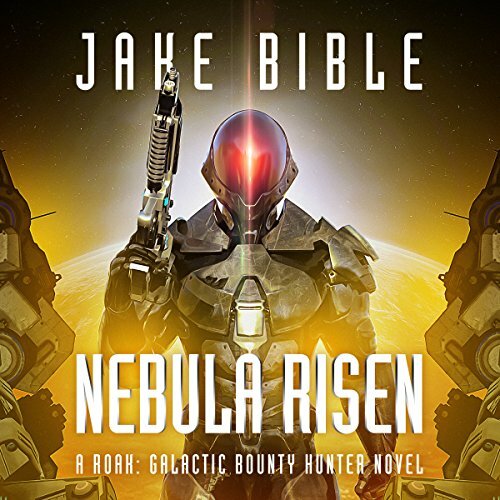 “Nebula Risen” is the second entry in the Roak series by author, Jake Bible. Set in a gritty science fiction future where space travel is commonplace, Roak is one of the top intergalactic bounty hunters around. Roak is a dark, but likable character with a certain sense of honor. I wouldn’t go so far as to say he’s a good guy, that would be too simplistic for an author of Jake Bible’s talent, but Roak is definitely not a bad guy either. Thus far in the series, Roak’s cases tend to be fast paced, action packed and violent with a bit of humor sprinkled in as well. The narrator, Andrew B. Wehrlen also offers a major contribution to the audio version of the book. His vocal choices for the male, female and alien characters are perfect. He really helps the listener become immersed in the story. The bottom line is, if your taste run in the areas of well written, science fiction action stories, you should have no problem enjoying “Nebula Risen.” It’s a fun, quick read/listen. Roam is back along with his smart mouth AI. As usual Roaks reputation has gotten him in a situation that will test his limits abilities and contacts to their limits. FaceTime is hired to find a fighter who is killed in front of billions of other beings. Some say he's alive since he is dead no matter what he has to find them and deliver him or else. The enigmatic being from his past syndicates bountyhunters chit hungry lowlifes are all in his way. But Royal always gets his job done and he ALWAYS gets paid his chits. That's just how the universe works. I was voluntarily provided this free review copy audiobook by the author, narrator, or publisher. Fun, entertaining and worth your time. Another great addition to the series. These books are just addicting. They are fun, humorous and very entertaining. This book helped to make a very unpleasant road trip (evacuating for Irma) a lot more tolerable. Even though this book is part of an ongoing series It can be listened to as a standalone. Jake Bible knows how to write a story that pulls you in from the start and never lets go. Between the action, intrigue, and suspense there is always something happening. Add in all the snarky sarcastic humor and Roak's penchant for getting into one situation after another and there is never a dull moment. Expecting Roak to do a job and not leave mayhem in his wake is impossible. He just has a knack for getting into and out of situations. Andrew B. Wehrlen once again does a fantastic job with the narration. He has one of those voices that just pulls you right into a story and makes it come to life. Clearly spoken with a smooth even pace. Great character voices. All of them... human, alien and a very independent AI. Perfect tone and delivery of the humor and sarcasm. He is the perfect narrator for this series. Very enjoyable. I enjoy everything about this series. Well worth the credit.